With more than 50 years of experience leading the century-old Sugar Grove Sunshine 4-H Club in Dallas County, Iowa, Lorna Grow knows what it takes to help kids succeed. It doesn’t mean giving everyone a participation ribbon. 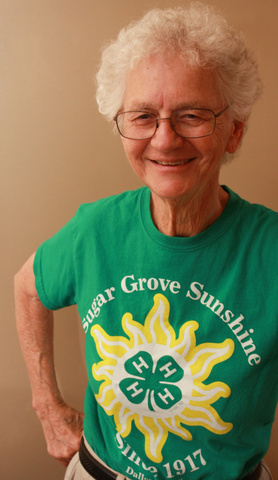 Lorna Grow has led the Sugar Grove Sunshine 4-H Club near Dallas Center, Iowa, since 1966. With her high-energy style, quick smile and lively personality, Grow is a hands-on instructor, whether she’s helping the kids refinish furniture, re-cane vintage chairs, bake a pie from scratch, sew on a button, hem pants, sew flannel-lined, zippered gun cases or complete basic home repairs like fixing a hole in the wall. While she coordinates 30- to 45-minute educational workshops that are held during the club’s meetings on the first Monday evening of the month, Grow doesn’t stop there. “Because I’m retired, I can devote additional time for extra activities,” said Grow, a great-grandmother who marches in local parades with her 4-Hers, helps her club sponsor a county-wide cooking challenge for 4-Hers and their friends, inspires 4-Hers in design-a-room competitions, works with them throughout the Dallas County Fair and supports them at the Iowa State Fair. 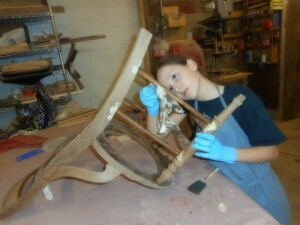 Refinishing furniture and chair caning offer Sugar Grove Sunshine 4-H Club members like Isabel Simpson the chance to learn skills they may not learn anywhere else. Grow has been involved with 4-H since 1943, when she joined the Union Lassies 4-H Club in Indianola. The all-girls club followed the traditional three-year program rotation of food, clothing and home improvement. The club that Grow would become most affiliated with, however, is the Sugar Grove Sunshine 4-H Club in Dallas County. This group dates back to 1917, when a 4-H club led by Mrs. A.J. (Mary) Hayes was founded at Sugar Grove No. 9, a one-room country school near Dallas Center. This 4-H sewing club had 10 members, met weekly and wore blue uniforms with white caps. The entire club traveled to the Iowa State Fair by car (quite an outing in those days) and marched in the state fair parade behind the 168th Infantry. The club evolved in 1922 into the Oblegro (Observe, Learn, Grow) Club. After an A.B.C. Club was organized in 1929, the two clubs joined and eventually became the Sugar Grove Sunshine 4-H Club, named after the local township. 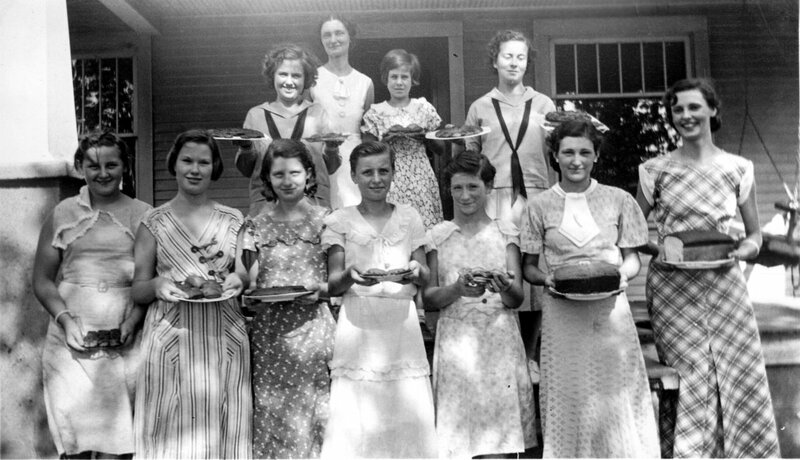 From 1918 through about 1965, the Dallas County Farm Bureau sponsored local 4-H clubs, which were separated into girls’ clubs and boys’ clubs. Today, the Sugar Grove Sunshine 4-H Club includes 42 boys and girls in grades 4 through 12 from Dallas Center, Adel, Van Meter, DeSoto, Perry, Grimes, Johnston and Urbandale. While it can be challenging for kids to find time for 4-H, due to busy schedules packed with sports, dance lessons and more, Grow refuses to schedule meetings on Sundays. “That’s family time,” she said. These parents value the life lessons that 4-H teaches, including decision-making skills, goal setting, leadership and teamwork. To enhance the learning, Grow assigns older 4-Hers to help mentor younger club members. 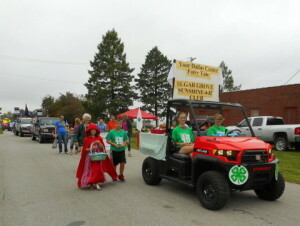 Members of the Sugar Grove Sunshine 4-H Club, along with club leader Lorna Grow, represented 4-H in this 2015 parade. The Sugar Grove Sunshine 4-H members have also gained a new appreciation for history by helping plan the club’s 100-year-anniversary celebration, which was held Sept. 24, 2016, at the iconic Lake Robbins Ballroom near Woodward. During the program, club members performed some of the songs that earlier generations of 4-Hers enjoyed from the 4-H Song Book. 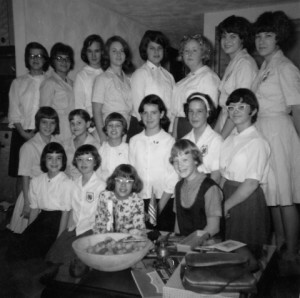 “The emphasis on music back then reflected people’s desire to get more culture into the rural areas,” said Grow, who added that the Adel Live Wires 4-H Club had an orchestra at one time. Club members also researched local 4-H club record books dating back to the 1930s, when club projects included altering dress patterns and answering roll-call questions like “my favorite radio program.” Club members also scanned photos of previous generations of 4-Hers, including a group of girls showing off their baked goods for the 1934 Achievement Day. “Back then, you had to go through Achievement Day to have your project qualify for the Dallas County Fair,” Grow said. While those early 4-H members used to meet in club members’ homes, today’s Sugar Grove Sunshine 4-H members meet in the basement of the Dallas Center Church of the Brethren. They also gather once a year at the Dallas Center-Grimes school to cook a meal and host an appreciation dinner for parents and guests. “We’ve served everything from Mexican to Chinese and prepare a four-course meal, including appetizers,” Grow said. 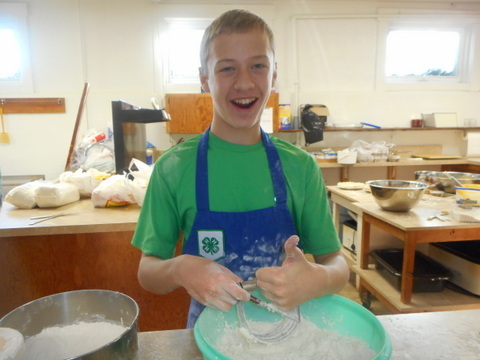 Members of the Sugar Grove Sunshine 4-H Club, like Jacob Storey, enjoy hands-on learning for pie baking and other skills.